General Officer Commanding, 101st Infantry Brigade, 34th Division, B.E.F. Next of Kin: Son of Mr and Mrs Edward B Fitton of Fairlea, Graham Road; husband of Mary Fitton of Island, Petersfield, Hants. Previous Employment: Regular Army Officer, veteran of Campaigns in the Sudan, Egypt (1885-88) and the Boer War. 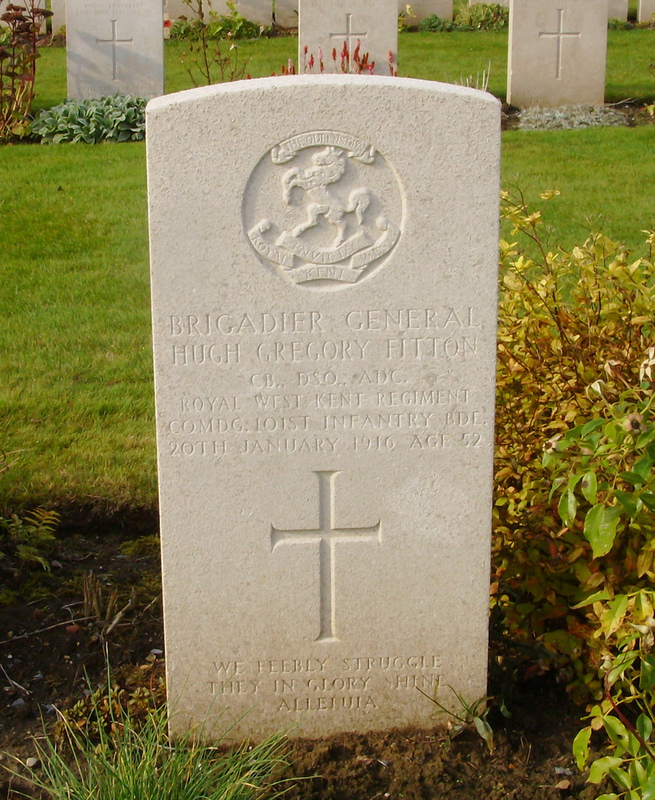 Brigadier General Fitton, the second son of the late Mr E B Fitton (Barrister and former HM Inspector of Factories) and Mrs Fitton of Fairlea, Graham Road, died from wounds received while inspecting trenches. He had been visiting the front line held by 16th Brigade near Vlamertinghe, north of Ypres on the 18th January (only 11 days after landing in France) to learn about trench warfare when he was shot by a sniper. He never regained consciousness, died two days later at 1.20pm in No. 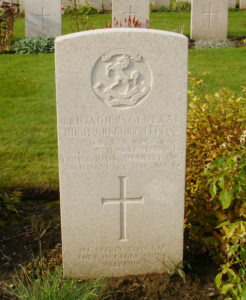 10 Casualty Clearing Station and was buried at Lijssenthoek Military Cemetery. The news reached his brigade as they were being inspected by General Joffre and Sir Douglas Haig. He was born on the 15th November 1863, to a musical family well-known in Malvern. They were connected with the Elgars, and his mother and sisters had many pieces of music dedicated to them (Isobel Fitton inspired one of the Engima Variations). Hugh Fitton was married in 1910 to May, the sixth daughter of the late Sir Alfred Hickman Bart, sometime MP for West Wolverhampton. He had a distinguished military career. He was elected Kings Scholar at Eton College in 1877 and passed from Eton to Sandhurst where he was first on the list in 1883. He was gazetted Lieutenant in the Royal Berkshire Regiment 1884, promoted Captain 1893 and Brevet Major 1898. Four years later he was transferred to the Royal Warwicks and in February 1904 was again transferred, this time to the Royal West Kents and appointed Lieutenant-Colonel 1905. He subsequently rose to rank of Colonel in 1909. He was a graduate of the Staff College and a qualified interpreter in Arabic and occupied many important staff positions. He served in several of the Sudan 1885, Egypt 1885-86 and several Nile Expeditions in the 1890s, and then in the Boer War 1899-1902. In 1905 he received the command of a Battalion of the Royal West Kent Regiment. In 1901 he was appointed Assistant Adjutant General Eastern Command and in 1913 Director of Recruiting and Organisation at the War Office. 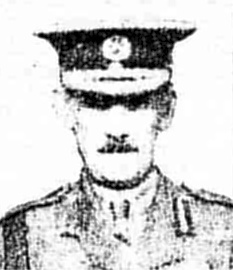 In 1914 he was given command of a brigade. To read more about his military career click here. He was a member of the Worcestershire Golf Club – the third of the club to be lost during the present war. His brother, Colonel Guy William Fitton, and Old Malvernian, served in the Army Pay Department. It is interesting that as late as three weeks before Fitton’s Brigade landed in France, it was preparing to be sent to Egypt. One wonders how much more effectively his skills learnt during the Egyptian and Sudanese campaigns could have been better put to use had the decision to switch destinations not been made. Nile Expedition 1897 – Staff Officer to GOC Flying Column (present at the occupation of Barber and march to Atarba River – he was MID and awarded the Order of Medjidee 4th Class and received a further clasp to his Egypt Medal. Nile Expedition 1898 – served as DAAG (present at Atbara and Khartoum – the night before Atbara he led four brigades across the desert in the half-light to within 200 yards of the exact position they were to take in action. The Spectator wrote in May 1898 “Capt Fitton has made a special study of what we may call desert navigation and is able to do by scientific observation what the Arabs do by instict; only he beats the Bedouin at his own business.” He was Mentioned in Dispatches and received the brevet of Major). Staff South African War 1899-1902 He was on the Staff as D.A.A.G. and later D.A.Q.M.G. to 7th Division throughtout the war. He served in the Orange Free State 2/5/1900 including Paardeberg, and was present at actions at Poplar Grove, Karee Siding, Vet River (5-6/5/1900), Zand River. He also served actions near Johannesburg and Pretoria May to June 1900 and again in Transvaal, November 1900 to May 1902. He was MID in September 1901 and July 1902 and received the brevet of Colonel. He received the QSA with 3 Clasps and KSA with 2 Clasps. In 1902 he was transferred as Major to the Royal Warwickshire Regiment and in 1904 as Second in Command to the Royal West Kents. He commanded a Battalion of the Royal West Kents in 1905. He was promoted Brigadier General November 1914 – and before going to front as Officer Commanding 101st Infantry Brigade he commanded Coastal Defences in a part of the East Coast of England. The Fittons were a musical family from Great Malvern, and great friends with the composer Sir Edward Elgar, his wife Alice and their daughter Carice. Edward Fitton (b. 1825) was a Londoner, who trained as a barrister and worked as “H M Inspector Of Fact”. His wife Harriet (1835-1924), also from London, was the daughter of Dr George Gregory, a Scottish amateur musician. She studied music in Germany and with Henry Brinley Richards who had lessons from Chopin. She was the accompanist of the Worcester Musical Union and the Hereford Philharmonic Society, and was renowned as a brilliant sight reader. She also played chamber music with Elgar, who was a first-rate violinist. The Fittons lived in Graham Road Malvern, between The Mount, where Carice Elgar went to school, and Forli, where the Elgars lived. They had one son, Hugh, and a whole tribe of musical daughters. Hilda Fitton (b. 1871) was a violinist, Monica (b.1880) a ‘cellist. Both were members of the Malvern Archery Club. Isabel Fitton (1868-1936) was also a violinist, who later took up the viola (good viola players, then as now, were a scarce commodity. Elgar was her first viola teacher, but she stopped her lessons with him, saying: ‘No, dear Edward, I value our friendship much too much!’ She is remembered today for being ‘Ysobel’, Variation VI in the ‘Enigma’ Variations which is built on an exercise he devised for her, for crossing strings on the viola. She never married, and lived all her life at the family home, ‘Fair Lea’, in Malvern. Considering the closeness of the friendship of the Elgars and Fittons dating from the 1880s, it is surprising that no mention is made of Hugh Fitton until 1912, when he features in Lady Elgar’s diary for that year. By then both Hugh Fitton and the Elgars were living in London. War Diary of 16th Infantry Brigade: PRO WO 95/?